The therapeutic role of the arts in fostering healing, growth, well-being and emotional expression is well-attested and long-standing. Whether painting, creative writing, crafting, singing or colouring, arts-based approaches are beginning to be recognised as credible and effective ways to promote good psychological health for all. There is currently a burgeoning of research on the arts and health, that is impacting policy and treatment. 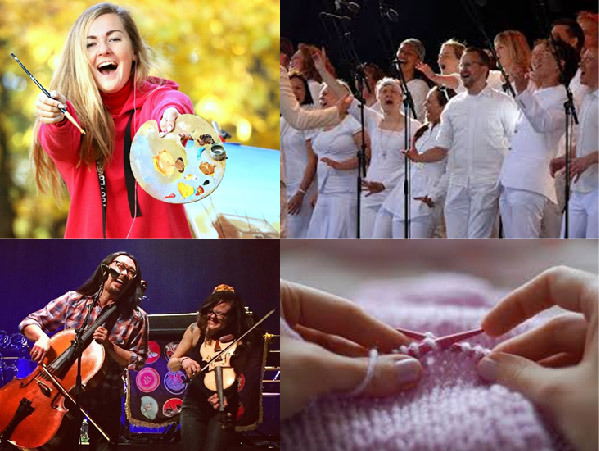 For example, recent research has suggested that singing can help reduce post-natal depression and improve lung-functioning, dance can help improve the balance and gait of people with Parkinson’s disease, poetry therapy can be a useful intervention for patients recovering from anorexia, expressive writing can decrease stress and improve immune system functioning, art making can help to reduce pain and distress in cancer patients, improve mental health and enable positive experiences such as happiness and mindfulness. Bodies such as the All-Party Parliamentary Group on Arts, Health and Wellbeing have assimilated such findings, and, based on these have made policy briefings recommending the increased commissioning of the arts to improve health and wellbeing (including ageing well, mental health, and the self-management of chronic conditions). While this may be having some impact (for example, the Government’s recent plans to increase access to arts on referral), caveats remain. There are limitations with the evidence base and numerous questions about the efficacy of the arts remain unanswered. For example, effects require replication, many reviews include heterogenous interventions, groups of people and wellbeing outcomes. 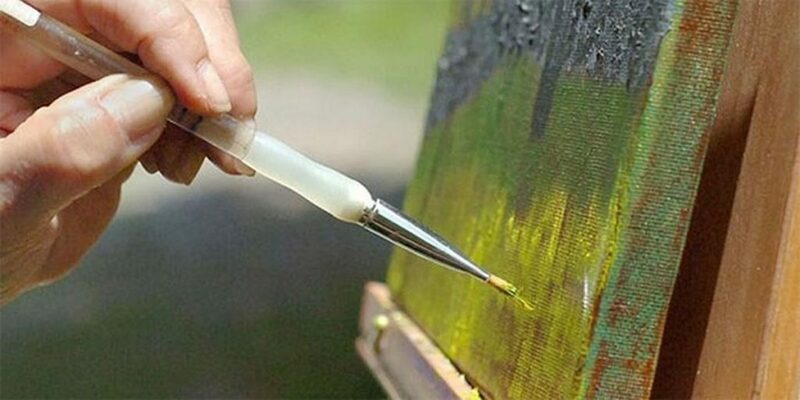 This can make it difficult to know which art treatments work best for whom, and why. It is also unclear how interventions should best be delivered, for example, the number of sessions required and the optimal spacing between them. The long-term benefits of arts interventions are also little known. Much profitable research has yet to be conducted on the arts and health, which will help to answer such questions. Indeed, my recent research suggests that ‘flow’ might be one mechanism to explain the health benefits of engaging with the arts. The arts might offer people the opportunity to experience degrees of absorption or flow in their daily lives, in a way that promotes wellbeing, either by being temporarily distracted from one’s pain or worries, or through engagement, joy and a consequent sense of mastery. Various crafts and arts activities might facilitate this experience, including drawing, knitting, and colouring. Colouring is an and accessible art activity that has been increasingly advocated for wellbeing, and evidence supports its use as a stress-reduction tool for University students. Recent research that I have conducted at UWE, with students on our undergraduate psychology programme, suggests that, not only might colouring, temporarily, at least, improve mood and promote the flow state, but might also improve cognitive functioning – both selective attention and creativity, potentially helping students to solve problems in everyday life. Of course, the flow state can be experienced in many activities in everyday life, and a range of other mechanisms have been proposed to explain the health benefits of art-making, some specific to particular forms of art. For example, it has been proposed that expressive writing may reduce cognitive rumination and anxiety following stressful events, creating a meaningful and more manageable narrative, impacting both psychological and long-term physical wellbeing (by improving immune system functioning). 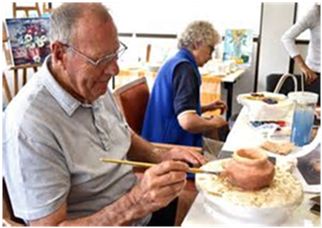 Further, many art groups perform an important social function, helping to reduce feelings of loneliness and isolation and improving people’s ability to relate to and communicate with others. Research on the mechanisms behind any wellbeing effect is important because we can help to identify to active ingredients of arts for health interventions (e.g. 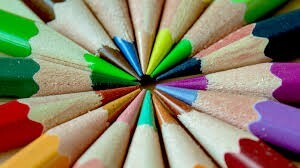 type of art, skills of the arts practitioner, group interaction) and modify these accordingly to optimise wellbeing. In the Faculty of Health and Social Sciences at UWE we have a number of academics interested in the arts and health, including our music therapy team. Academics from different disciplines come together as a teaching team on the Level Three Psychology module, The Arts and Mental Health, led by myself, delivering an exciting and diverse array of topics, including art psychotherapy, music therapy, music in prisons, poetry therapy, craftivism, and the arts and dementia. As a next step I have begun a multidisciplinary Special Interest Research Group at UWE with Dr Liz Jenkinson, hoping to facilitate research collaborations on the arts and health, within and beyond UWE. This is entitled DRAW: Developing Research on the Arts and Well-being, housed within the Promoting Psychological Health strand of PSRG (Psychological Sciences Research Group). Interests of DRAW include developing new arts interventions, evaluating existing arts interventions, researching mechanisms to explain the health benefits of engagement with the arts and the use of the arts in creative research methods. The members of DRAW bring together a diverse range of knowledge and expertise and we are looking forward to collaborating and extending our research and evaluation of arts for health. For instance, Dr Liz Jenkinson and the health psychology team at UWE are experts in understanding patient experiences of acute and chronic health conditions, and the design and evaluation of effective psychosocial support. 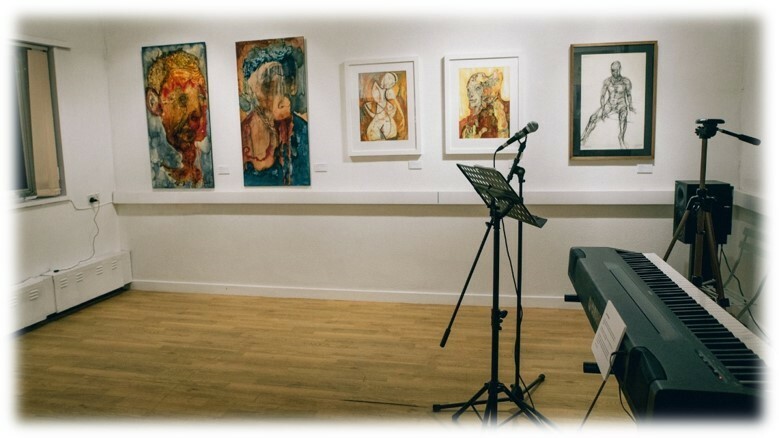 The use of the arts in health care as a therapeutic tool in promoting good psychological and physical health is an area in which DRAW has begun to collaborate with organisations such as Fresh Arts, who provide arts-based interventions for patients at Southmead Hospital, including arts on referral for cancer patients. Liz is also working with colleagues at UWE in Visual Culture and the Arts with the aim of developing a new arts for health intervention with young mums. Another DRAW member, Dr Mike Chase has over 20 years of experience of working and researching in the voluntary and statutory community sector, and has been using mixed-methods to evaluate the use of music and arts interventions in community settings, including the Outsider Gallery, in London. Mike hopes to extend this collaboration further, for example taking arts and music interventions to young people’s forensic units in Bristol. At DRAW we have also been evaluating whether ‘prescribing’ a course of art workshops to people experiencing depression, anxiety or loneliness can improve wellbeing. ‘Arts on prescription’ or ‘arts on referral’ forms part of the wider remit of social prescribing, where doctors, nurses or other primary care professionals prescribe non-clinical activities (including nature walks, cooking or singing workshops) with the expectation that this will improve the health of participants. Although the Government plans to increase the use of social prescribing in the NHS, including arts on prescription, there is only a limited, but encouraging, evidence base for its efficacy. I have been working with the recently formed Bristol Arts on Referral Alliance (BARA) to help contribute to the evidence base for arts on prescription. BARA provides 13 art workshops across Bristol, and 6 follow-on groups, embedded within a larger social prescribing scheme, funded by Bristol City Council, Bristol CCG and charitable foundations. We have been using a mixed methods design, including semi-structured interviews with participants, and drawing on existing pre-post intervention evaluation frameworks. Further, based on my research using the experience sampling method, participants have been tracking their mood over time, for the duration of each 12-week-long art course. Indeed, this has become a meaningful part of the art workshops for participants, reflecting on their current mood at the start and end of each workshop. This data will enable us to test whether any increases in wellbeing at the end of each course are predicted by reductions in stress, increased energy and happiness, directly following making art. The first round of data collection is now complete and will be analysed and disseminated over the next few months, some initial outcomes having been presented at the 1st International Social Prescribing Network Research Conference in June 2018. The team at DRAW are interested in using the arts themselves as tools for collecting and disseminating data. 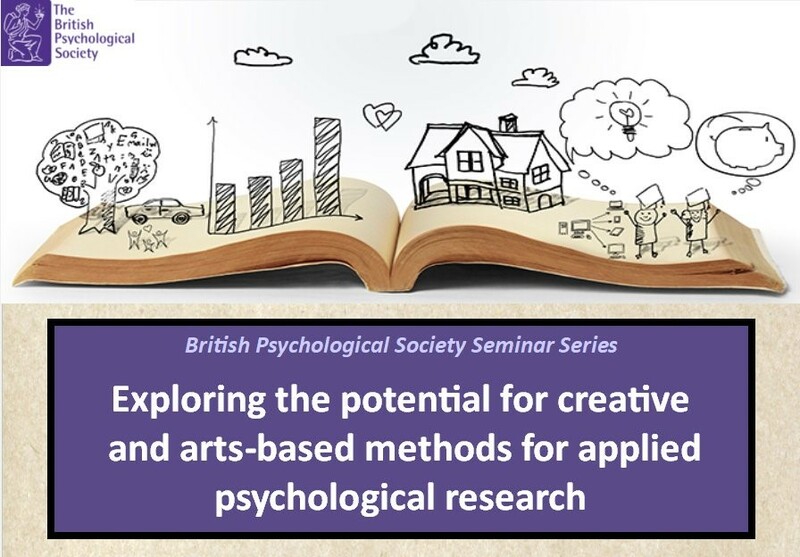 Led by Victoria Clarke, and in collaboration with Psychologists at the Universities of Aston and Bath, Liz and I have received funding from the BPS to run a seminar series exploring the potential for creative and arts-based methods for applied psychological research. You can learn more about this venture here. We hope that this series will inspire us to use the arts more creatively, as a research tool, in future projects. Using the arts and evaluation tools might offer a creative, more empowering and enjoyable way for participants in arts for health interventions to communicate their experiences and to disseminate these to others. These are exciting times to be conducting research on the arts and health, with potential for new and innovative projects and collaborations. We hope to grow our research and evaluation at UWE on this topic and develop collaborations with others, within UWE and beyond. We welcome members to our new special interest group, DRAW, and hope you can join us for our upcoming seminar series which runs from May-July 2019. In the meantime, why not have a go at some arts for health activities – for example UWE’s Feel Good February events include crafting and creative writing! Next Next post: Shining the light on implicit bias: Do we really know what we believe? Shining the light on implicit bias: Do we really know what we believe?